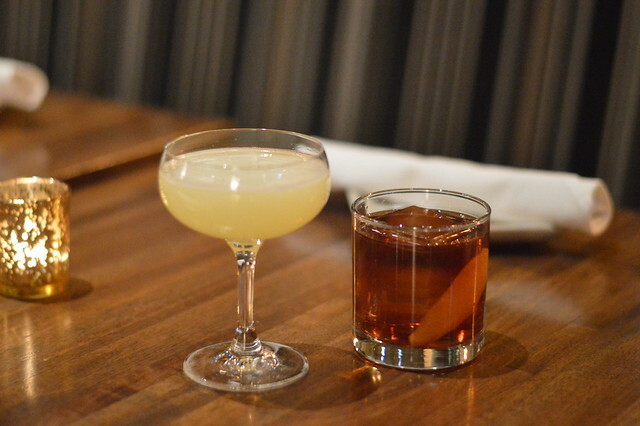 On a recent Staycation at the Hotel Palomar here in Chicago, I was excited when the hotel management invited me for cocktails at Sable Kitchen & Bar. With hubby Christopher in tow, we shimmied downstairs for pre-dinner cocktails. Sable is a lively restaurant and bar; I loved the atmosphere in the early evening. With dimmed lights, and a long bar that stretched across the restaurant,the ambiance gave a relaxed, easy-going vibe. A favorite detail of mine was the illuminated counter at the front of the bar. The restaurant’s extremely extensive bar menu was quite overwhelming, but our server was happy to guide us through it. As a lover of gin & tonics, I was instantly drawn to the Spanish-style gin & tonics on the menu. 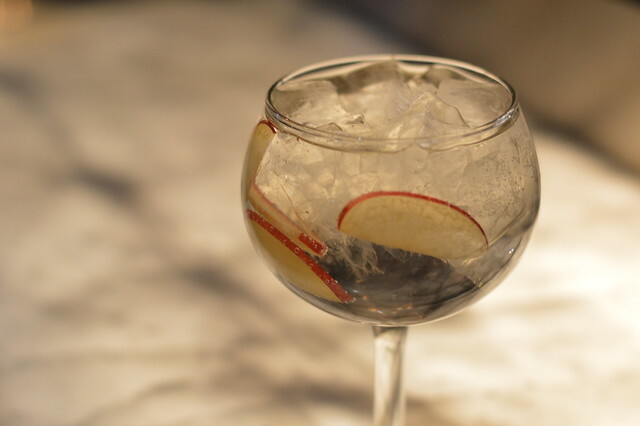 A Spanish Gin & Tonic differs from a standard G&T in two ways. For one, it is massive, and second, it has a variety of fresh fruit in it. I went with what I believe was the Nikka Coffey, made with Fever Tree Indian Tonic, apple, Thai basil, and Thai chili. It was bright, refreshing, and herbaceous with undertones of spice and fresh fruit. Chris opted for (at my request) a beverage that included an egg white; the “Flight 1095.” I love a good frothy concoction. Chris’ cocktail was light and refreshing with a hint of sweetness. We both loved it. For round two of beverages, we decided to try two of Sable’s signature cocktails. At the suggestion of one of the bartenders, Chris went with a cocktail called “Good Luck and Good Night,” made with High West Double Rye, Amaro di Angostura, Averna, Tempus Fugit crème de cacao, Bittercube Jamaican no.1 bitters, and orange essence. It was essentially a fancier Manhattan that was more booze forward. It had a full flavor that while smooth, still had quite the punch. It was perfect for a cold February evening as it warmed up our insides. I couldn’t resist going for a cocktail called “The Dog’s Bullocks.” Naturally I loved the name, but I also love a cocktail made with sesame. It adds a unique nuttiness to a beverage that I am a big fan of. 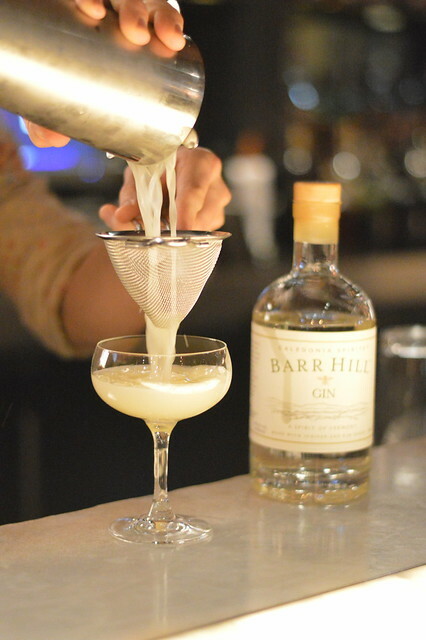 Made with Barr Hill gin, sesame, honey, ginger, lemon, and Bitter End Curry bitters, it was my ideal cocktail. Sable’s bar program is really impressive. It is extensive, and the unique creations are thoughtful and well executed. There is sure to be something for everyone. Also it has one of the best whiskey lists in the country. It’s situated in the perfect location, right in River North with proximity to downtown and many things to do. 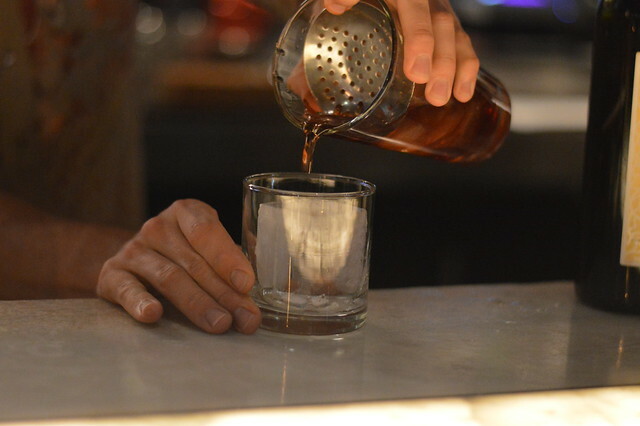 We highly recommend stopping in for a drink while exploring the city. During the day the large windows that surround the restaurant let in so much light, it is really lovely. At night, enjoy cocktails in the comfortable space for intimate cocktails at a high top or gather friends in the back lounge area.